https://sep.yimg.com/ay/yhst-33477391359232/cat-s-paw-coral-pink-stylophora-species-stylophora-coral-brush-coral-club-finger-coral-gypsy-coral-stump-coral-6.jpgCat's Paw Coral - Pink - Stylophora species - Stylophora Coral - Brush Coral - Club Finger Coral - Gypsy Coral - Stump CoralDifficultPeacefulYesCalcium, Strontium, Trace elementsIndo-PacifcPocilloporidaeSmall 2" - 3"
As the name suggests, Cat's Paw Coral � Pink is shaped like a cat�s paw and is pink in color. The subtle shade of Cat's Paw Coral - Pink enhances the visual appeal of a marine aquarium manifolds. Moderately hardy and difficult to maintain, Cat's Paw Coral � Pink is better placed in an established aquarium and should be handled by an experienced aquarist. The article introduces you to the various aspects of Cat�s Paw Coral � Pink. Taxonomy: Cat's Paw Coral � Pink belongs to the Kingdom Animalia, Phylum Cnidaria, Class Anthozoa, Family Pocilloporidae and Genus Stylophora. Scientific names: The scientific name of Cat's Paw Coral � Pink is Stylophora species. Other common names: Cat's Paw Coral - Pink is also commonly called as Brush Coral, Stylophora Coral, Club Foot Coral, Stump Coral, Club Finger Coral, Cluster Coral, Bird�s Nest Coral and Gypsy Coral. Coral Type: Cat's Paw Coral - Pink is a Small Polyp Stony (SPS) Coral. Origin or natural range: The Stylophora species is found in the Indo � Pacific region including Fiji, Tonga, the Solomon Islands and the Great Barrier Reef and the Red Sea. Color: Cat's Paw Coral - Pink is pink in color with the combinations of brown and tan as the color variations. Compatibility: The Stylophora species is non-aggressive towards the other marine aquarium invertebrates. Habit & Habitat: Cat's Paw Coral � Pink is found on the fore-reef in the marine water bodies. The Stylophora species is moderately hardy. Cat's Paw Coral � Pink has branches that are circular in shape with blunt tips. Water flow in the aquarium: Cat's Paw Coral - Pink requires strong water flow in the marine aquarium hosting it. The Stylophora species requires high-intensity lighting in the marine aquarium it inhabits. High intensity Metal Halide lighting is recommended in the case of Cat's Paw Coral - Pink. Alternatively, high intensity Power Compact and T-5 Fluorescent lighting is also fine. The coloration of Cat's Paw Coral - Pink may vary depending upon the intensity of light it is exposed to. You can place the Stylophora species anywhere in your established marine aquarium. 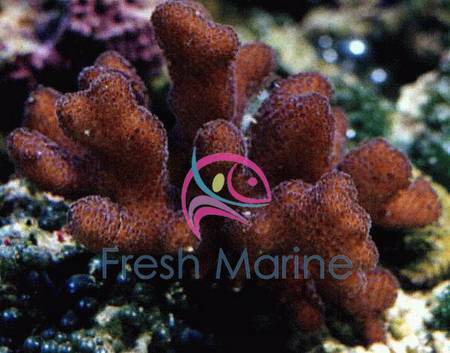 Cat's Paw Coral � Pink grows rapidly if it gets favorable conditions in your marine aquarium. The Stylophora species derives its nutrition mainly through photosynthesis which is performed by zooxanthellae, a photosynthetic alga living symbiotically within the coral. Cat's Paw Coral � Pink is Planktivorous in feeding habit and filter-feeds a few times per week, when open. The Stylophora species feeds upon acellular marine invertebrates, phytoplankton and zooplankton. Provide the food to Cat's Paw Coral � Pink in the form of a paste. Add Calcium, Strontium and Trace Elements to the water as dietary supplements for the Stylophora species. Keep Ammonia and Nitrites levels in the water at zero. Nitrates level in the water should be greater than 0.20 PPM. Breeding: Cat's Paw Coral � Pink breeds easily and rapidly in a marine aquarium if the conditions therein are favorable for the coral. Care: Cat's Paw Coral - Pink requires high maintenance.